On the seventh of the Twelve Days of Christmas at The Restaurant at Meadowood, Christopher Kostow gave to me Morihiro Onodera. Earlier this year, when Kostow sent me the finalized list of guest chefs for this dinner series, Onodera’s was the only name on the roster that I did not know. So, in the true spirit of the Twelve Days of Christmas, as it was intended by Kostow, I was introduced to an exciting voice in the culinary world that I probably would not have encountered otherwise. 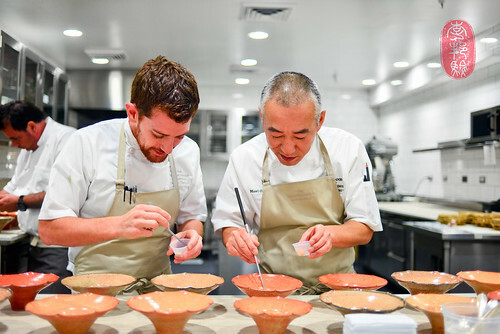 Last May, after more than a decade of business, Onodera sold his restaurant, Mori Sushi in Los Angeles, to pursue other interests, like cultivating short-grained rices in Uruguay (which he sells to Japan), and making ceramic earthenware (all of Onodera’s courses at this dinner were plated on dishes that he made for this dinner). 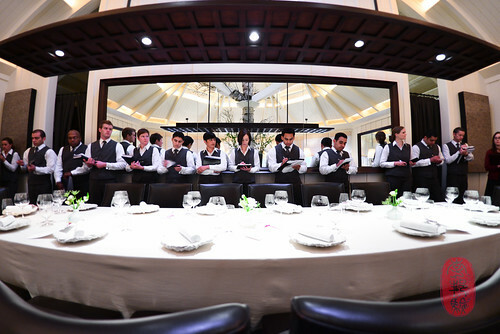 Last week, on the seventh night of the Twelve Days of Christmas at Meadowood Napa Valley, he and Kostow cooked seven dishes paired with wines from Pahlmeyer Winery. Kostow was introduced to Onodera by Josiah Citrin, chef of the restaurant Mélisse and a former guest chef at the Twelve Days of Christmas. Citrin flew up to St. Helena to help Onodera with this dinner. There is a simplicity to Onodera’s cooking that I enjoyed. His flavors are clean and lean, belying the tremendous amount of experience and technique standing behind them. He showed us the difference between two brown rices, one more polished than the other. Cooking both, he formed them into bundles (like the way you would for nigiri sushi) and offered them with nothing but a dash of sesame seeds. He also let us taste the difference in three different cuts of yellowtail tuna: loin, cheek, and belly. He cooked each one in a different way, and served them with grilled and raw matsutake mushrooms and a bit of chrysanthemum “pesto.” This was plated in a pretty little ceramic basket. For one of his canapés, Onodera pickled baby vegetables (carrots, radishes, and cucumbers) by burying them in a three year-old brown rice fermentation overnight (it was a thick, chunky clay-like paste). The vegetables softened slightly in the pickling, and took on the acidity and flavor of the brown rice fermentation. Onodera also made tofu from scratch for one of Kostow’s canapés. The silky, delicate tofu was cubed and served on fried yuba chips with caviar. Kostow’s bowl of tart, thick yogurt topped with tangy umeboshi and toasty, sweet clusters of buckwheat was one of my favorite dishes of this dinner series so far. It paired particularly well with the wine, a Chardonnay from the Sonoma coast. You’ll find the entire menu from last night’s Twelve Days of Christmas dinner with Morihiro Onodera, and a slideshow of the dinner below. Whey, snails, onions, and horseradish. ~ by ulterior epicure on December 19, 2012.